In movie theaters 50 years ago, a tough detective in a badass 1968 Mustang taught a 1968 Dodge Charger a thing or two about running from the law. 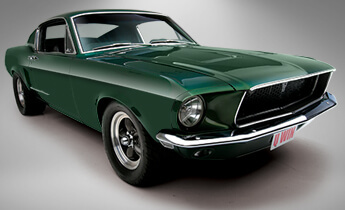 The movie, Bullitt, starring Steve McQueen, became an anthem for Ford Mustang fans. Bullitt’s car-chase sequence, with McQueen’s mean-green Mustang man-handling the hills of San Francisco, is considered the most realistic chase scene in movie history. Now you can bring home a fully restored, show-stopping Mustang Bullitt, which Steve McQueen, if he were alive, would love to drive, in the 2018 Mustang Dream Giveaway. Restored with One Rule: Money is no Object! 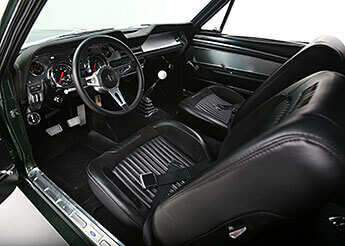 This fully restored 1968 Mustang Bullitt was meticulously restored with one goal in mind: perfection. 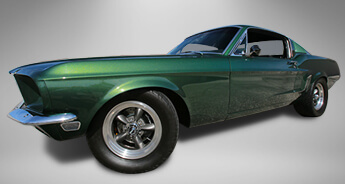 It starts with show-quality metallic green paint expertly applied over classic, straight-as-a-board Mustang body panels. 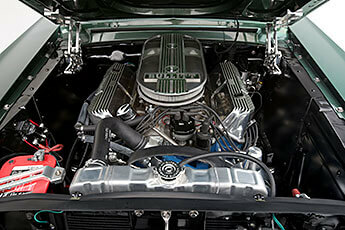 From engine bay to undercarriage, attention to detail is evident in the top-tier restoration. A restoration of this caliber would take two years or more to complete, but you won’t have to wait in line when you enter to win it in the 2018 Mustang Dream Giveaway. Underneath the hood of this Mustang Bullitt, you’ll find the ultimate in performance and fun: a 390ci Ford high-performance engine with dual four-barrel carbs and intake, billet belt-drive system and accessories, modern rack-and-pinion steering and performance headers. Turn your attention to this grand-prize Mustang’s driveline and you’re likely agree with us that it’s Bullitt-proof, thanks to an easy-shifting five-speed manual transmission, Ford Racing flywheel, street performance clutch, Moser Ford 9-inch rear end and Strange axles. 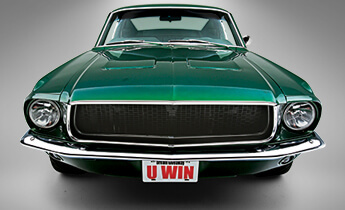 Weighing in at 400 horsepower, this grand-prize Mustang Bullitt is your all-access pass to fun, fun, fun. You can’t buy it, but you can win it in the 2018 Mustang Dream Giveaway. This year, Dream Giveaway donors asked for a grand-prize Mustang that combined classic chiseled looks with modern performance and safety. The automobile hobby calls it a restomod (restoration + modern parts/technology). It draws from all the amazing advancements in automobile technology over the past 40-plus years to enhance this classic Mustang’s drivability. That means you can drive this legendary Mustang Bullitt anywhere your imagination takes you without compromising on the performance, comfort and safety features available today.